HAPSMobile Hawk 30 to Start Flight Tests Soon » UAV DACH e.V. A secretive joint venture between SoftBank and U.S. aerospace company AeroVironment is poised to launch an experimental solar-powered drone to deliver connectivity for 5G and the Internet of Things. The Hawk 30 will have a curved “flying wing” design similar to a series of high-altitude solar drones that AeroVironment made for NASA twenty years ago. Filings with the Federal Aviation Administration and the Securities and Exchange Commission suggest the new Hawk will have 10 electric engines and an operational altitude of over 20 kilometers. According to a Space Act Agreement [PDF] signed with NASA in November, the prototype drone could take to the air for the first time at NASA’s Armstrong Flight Research Center in California very soon. The initial agreement with NASA covers a series of flight tests over the next three months, up to an altitude of 3 kilometers. AeroVironment did not immediately reply to requests for comment. AeroVironment is no stranger to high altitude, lightweight aircraft. Beginning in 1997, the company built three solar- and fuel cell-powered drones under NASA’s Environmental Research Aircraft and Sensor Technology program. Its final drone for NASA was the Helios Prototype, an elegant flying wing wider than a 747 but weighing less than just one of the jumbo jet’s 18 landing wheels, thanks to its composite material construction. The Helios still holds the altitude record for horizontal flight by a winged aircraft, reaching nearly 30 kilometers back in 2001. 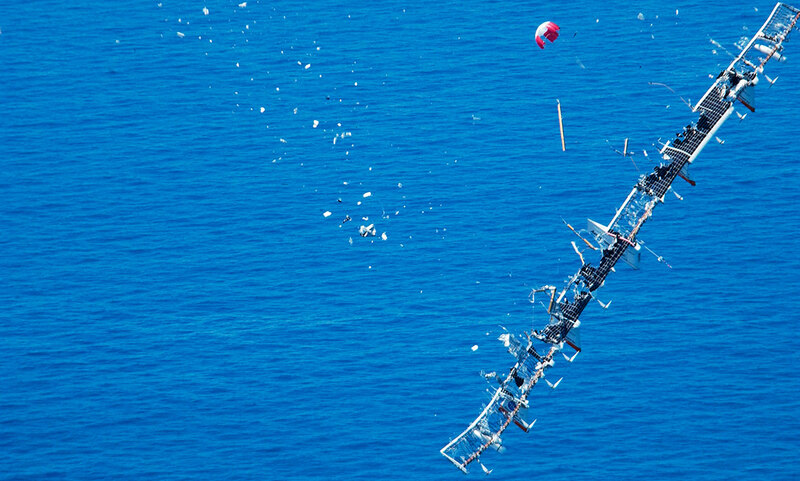 However, the Helios brought NASA’s solar drone research to a sudden end in 2003, when it broke up in high winds during a test flight in Hawaii. AeroVironment built yet another prototype HALE drone, called Global Observer, for the Pentagon in 2010, to carry communications and surveillance payloads. That program also ended in a crash, the following year. These problems with HALE aircraft did not dissuade Facebook and Google from attempting to develop their own high altitude, solar-powered drones. Both were seeking new ways to bring Internet access to remote communities in under-developed countries around the world. Google bought a company called Titan Aerospace in 2014, and carried out numerous tests of a 5G system called SkyBender at Spaceport America in 2016. Its parent company, Alphabet, eventually grounded the drones in 2017 to focus on Loon, which is now an Alphabet subsidiary delivering commercial Internet service from high-altitude balloons. Facebook also wanted to test its enormous, stratospheric Aquila drones at the Spaceport, but shelved its plans last year after fragile prototypes were damaged on landing. Now AeroVironment is ready to try once more. In January 2018, Japanese technology conglomerate SoftBank and AeroVironment formed a joint venture called HAPSMobile to develop a solar-powered HALE drone for commercial operations. HAPS is an acronym standing for high altitude, pseudo-satellite. “For many years, we have fully understood the incredible value HALE unmanned aircraft platforms could deliver to countless organizations and millions of people around the world through remote sensing and last mile, next generation IoT connectivity,” said Wahid Nawabi, CEO of AeroVironment, at the time. Since then, HAPSMobile has largely operated in stealth mode, with no public presence and a website that simply says “Coming Soon.” However, SEC filings show the new company has a budget of US $76.5 million to design, build, and test the Hawk 30, including high altitude and long duration flights. A presentation for AeroVironment investors [PDF] last June provided images and more details of the drone. A graphic shows the Hawk circling over a wide area at an altitude of 20 kilometers, with a single aircraft providing coverage equivalent to 1,800 traditional cell towers. The Hawk can be controlled manually, or can autonomously navigate a pre-planned route. Of course, the aircraft is only one component of any future stratospheric Internet system. Google and Facebook had experimented with millimeter-wave and laser connectivity for their drones, and AeroVironment has made several experimental filings for tests in millimeter wave and other radio bands with the Federal Communications Commission (FCC) in connection with the Hawk 30. Although none detail the Hawk’s intended communications payload, those filings do confirm that AeroVironment will be testing the drone in California, near the Armstrong Flight Research Center at Edwards Air Force Base, and also on the small island of Lanai in Hawaii. “The tests will address integrating the transceivers at different altitudes in the solar environment,” reads one filing [PDF]. AeroVironment is paying NASA nearly $800,000 to supervise and provide ground support for the upcoming low altitude tests, which are scheduled to continue until the end of June. If those are successful, the company will go higher in its next round. “The project envisions testing in varied environments, including significantly higher altitudes. AeroVironment will return to the Commission to seek the necessary authorizations relating to higher altitudes,” the company told the FCC. Despite Google and Facebook withdrawing from the Internet drone race, the Hawk 30 still faces some serious rivals. Boeing subsidiary Aurora Flight Sciences has an extremely similar looking aircraft called Odysseus, while Airbus is building its own HALE Internet drone, Zephyr. Only time will tell whether any of them can overcome the curse of previous HALE aircraft, and establish a permanent Internet presence in the stratosphere. UAV DACH: Beitrag im Original auf https://www.uasvision.com/2019/03/19/hapsmobile-hawk-30-to-start-flight-tests-soon/, mit freundlicher Genehmigung von UAS Vision automatisch importiert. Der Beitrag gibt nicht unbedingt die Meinung oder Position des UAV DACH e.V. wieder. Das Original ist in englischer Sprache.